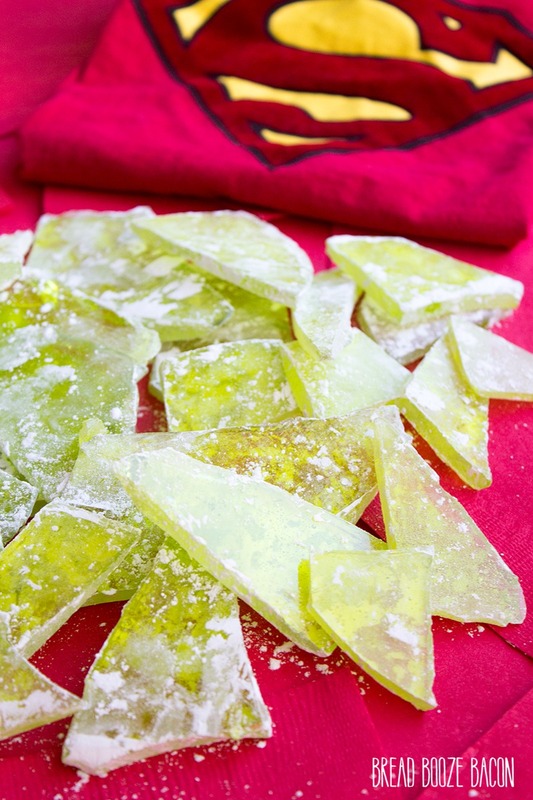 Get ready to take down Superman with our Kryptonite Rock Candy! No super-villain should leave home without it! It’s the perfect treat for your super heroes! My boys are OBSESSED with superheroes. It doesn’t matter if it’s DC or Marvel, if they’re got a comic book, my kids are in! With the release of Batman vs. Superman today and my youngest’s request for a Justice League birthday party next weekend I wanted to man something fun that all the kids would love. And what kid doesn’t love candy?! This candy came out awesome! The color is perfect and it was surprisingly easy to make. This coming from the girl who never makes candy, fudge, or any of that stuff. If I can do it, you can do it! 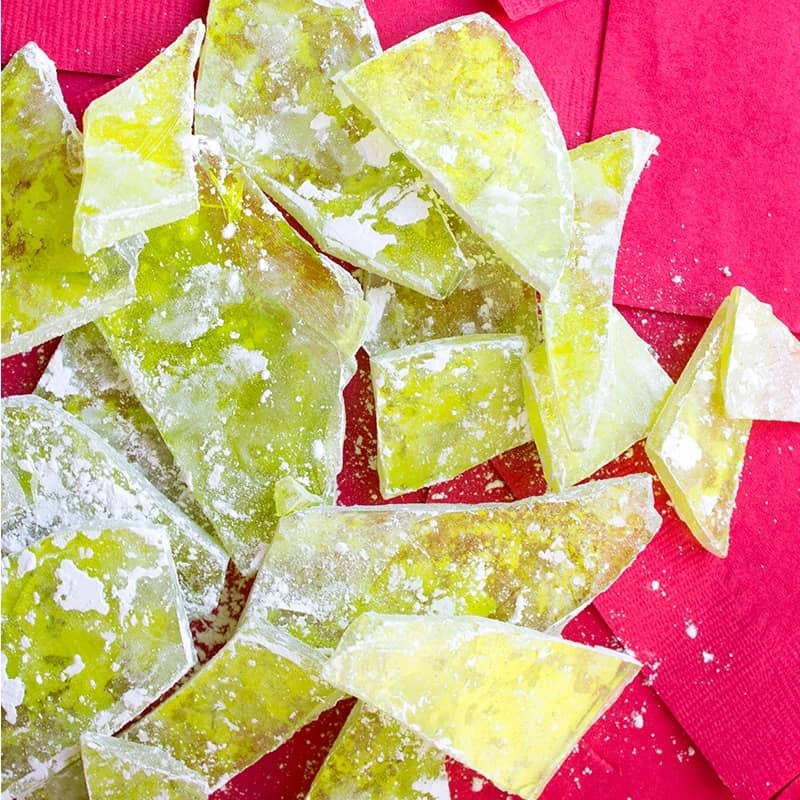 When I was researching how I was going to do this recipe I found a couple really cool things you can do with this candy idea on the Instructables. They’ll show you how to get a crystal shape for your candy (if random shard aren’t your thing), and you can even make you candy glow in the dark! Okay it’s under black light, but still. SO COOL! The fun doesn’t stop here though. You can get everything you need to have your own superhero party with all the cool ideas from the blockbuster bloggers crew! 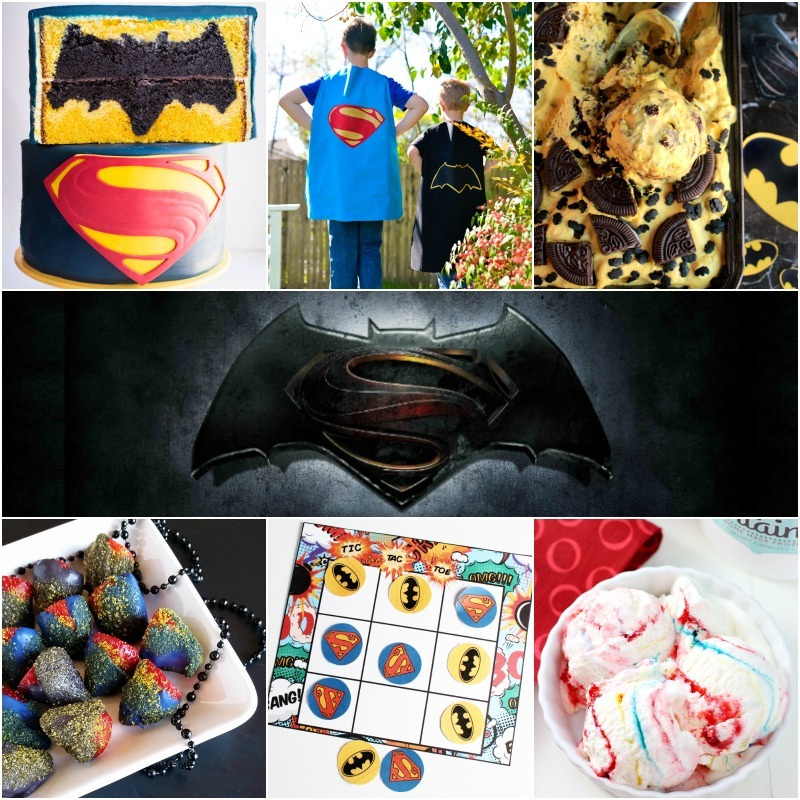 We have more desserts, games, superhero capes!! It’s a one stop shop! 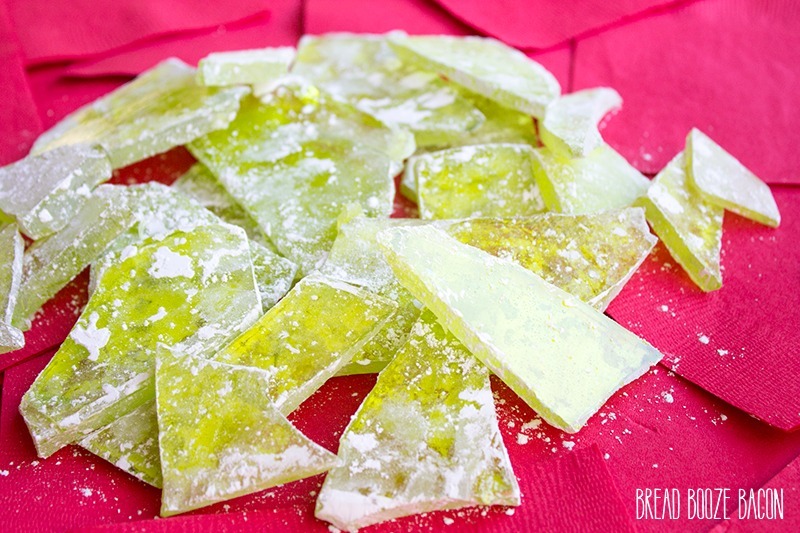 Get ready to take down Superman with our Kryptonite Rock Candy! No super-villain should leave home without it! It's the perfect treat for your super heroes! Line a baking sheet with parchment paper or a Sil-Pat and set aside. In a heavy saucepan over medium-high heat, whisk together the sugar, corn syrup, water, and cream of tartar. Keep cooking and stirring occasionally until the sugar has dissolved. Bring the liquid to a boil and then reduce the heat to medium / medium-high. Place the candy thermometer into the liquid candy being sure the probe does not touch the bottom of the pan. Cook for 20 to 40 minutes, or until the candy reaches 300 degrees F on the candy thermometer. Removed from the heat and whisk in the food coloring and candy flavoring, if desired. Immediately pour onto the prepared baking sheet. 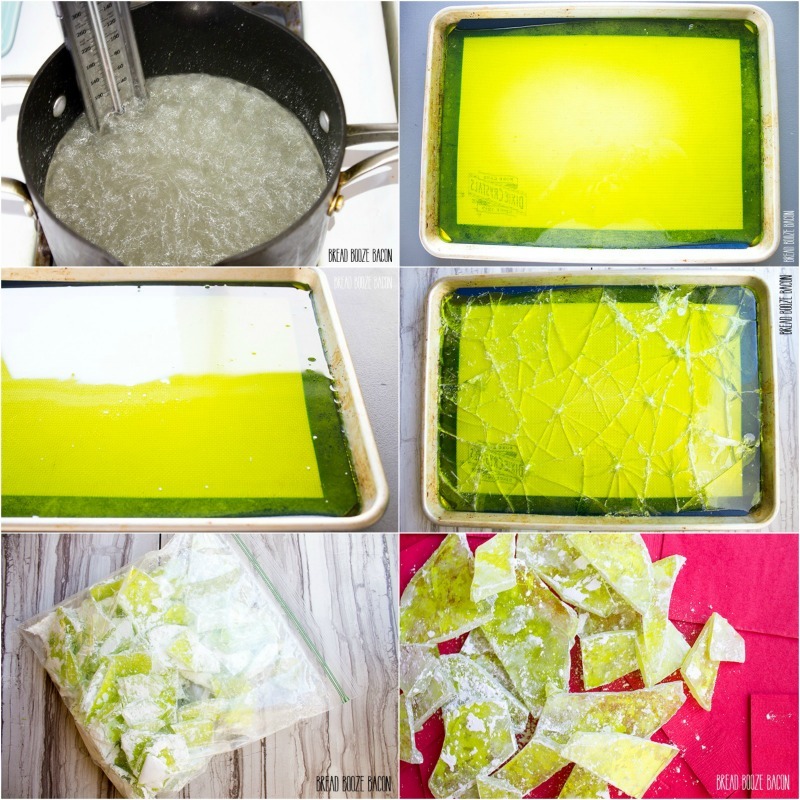 Break the candy into medium sized pieces. I used a metal skewer and meat mallet to accomplish this, but you can use whatever you have on hand. Pour the powdered sugar into a gallon sized Ziploc bag. Add the candy pieces to the bag. Seal the bag and gently roll around the candy and the sugar until the candy has a light dusting over all of the pieces. Serve immediately or store in the same bag until ready to eat. 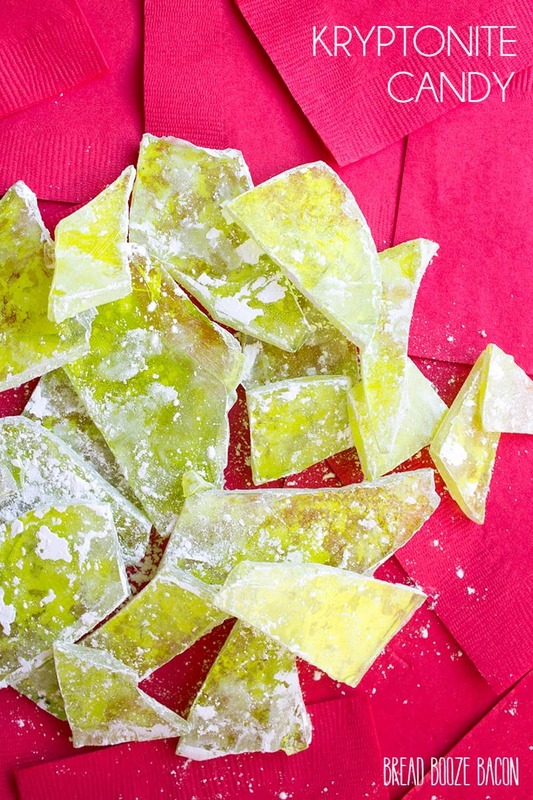 Suggested flavorings include mint oil, green apple oil, lime oil, or vanilla extract. ONLY adding flavoring to the candy at the very end once the hot candy has been removed from the heat. Be carefully when adding the flavoring in as the candy may sputter & steam, and push that aroma right back into your face. You can also use any food color & flavor combination you like to make this candy match your party or holiday theme. I’m taking our son to see superman this weekend. I might see if I can find some time to bake and take it with us to the movie. 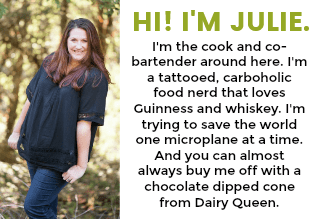 Okay, so I don’t know this lady’s blog (or how you feel about hummus)…but this is totally bright green! That looks great! Thank you so much for finding something! I think you could come up with something too, lol. 😛 Also I’m going to put a little piece of your Kryptonite Candy on top of my Jello Shots. Epic. You’re awesome sauce.